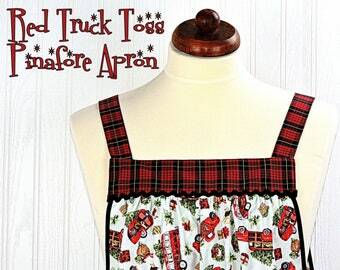 Retro-chic red gingham apron (combined with a lovely accent fabric-- featuring bright cherries & polka dots on a black background) which is designed to be so easy to put on and take off-- with no ties, buttons, or fasteners of any kind. 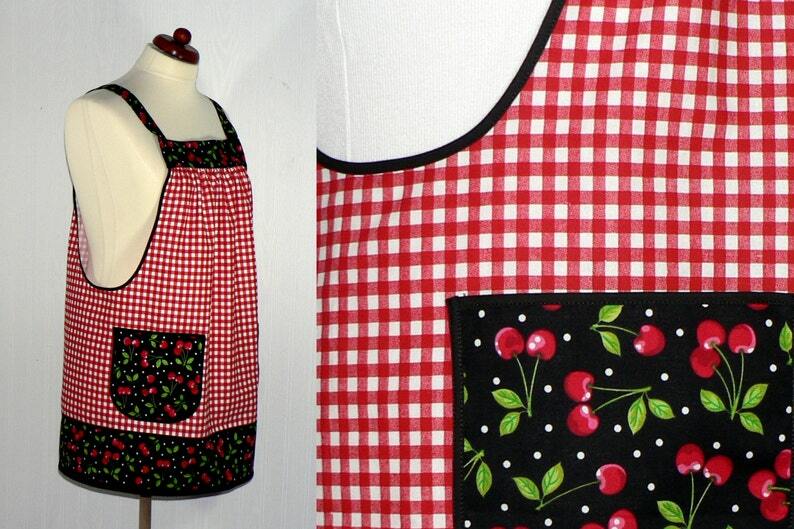 ( I originally created this style of apron for a friend with limited mobility.) 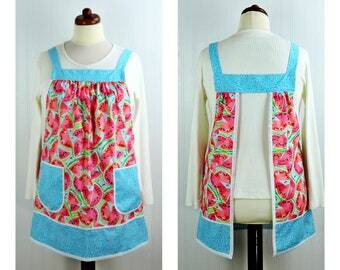 Simply slip the apron over your head like a t-shirt and slide your arms into the generous openings to put it on. 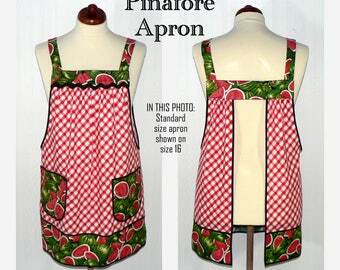 Apron rests totally on the shoulders, placing no strain on the neck. Super comfortable for all day wear! Apron fully covers your clothing for protection while you are working around the house, but is completely split up the back (to the band at the top) to allow freedom of movement. Armholes are bound with a coordinating bias binding for extra strength and durability. Extra large patch pockets are so handy for many purposes. I do not keep an inventory. This apron is not sewn until after order confirmation. 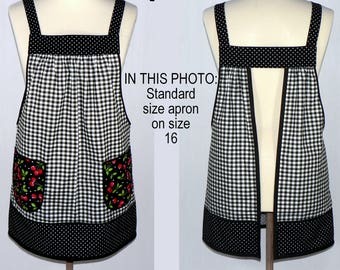 Apron in photos is the original sample sewn to take listing photos. 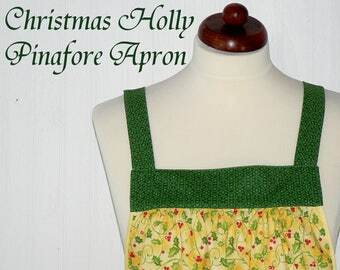 As with any handmade creation, fabric design placement will vary from apron to apron. Apron is gathered in front and back where it attaches at the top bands, and fits many sizes due to its unique design. Loose fitting and very comfortable style to wear. Also great for expectant moms! Makes a great gift for the cooking/baking enthusiast on your gift list-- or for a very special little treat for yourself! 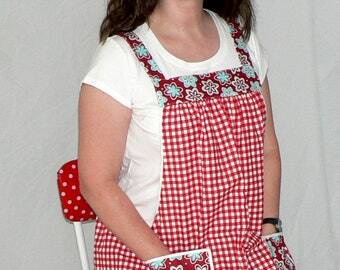 Check out my feedback section to see what my lovely customers have said about this apron: https://www.etsy.com/your/shops/LauriesGiftsBiz/reviews Many of my customers wear this apron as a pinafore top over a t-shirt and leggings, since they don't cook. Best fit for hips/waist smaller than 39"
Best fit for hips/waist measuring between 49" - 63"
Love it....love it...love it. I use it to go out and take care of my goats and donkeys, turkeys, calf. I keep the treats in the pockets. Which leaves my hands free to pet and love my 4 legged babys. Thank you ! 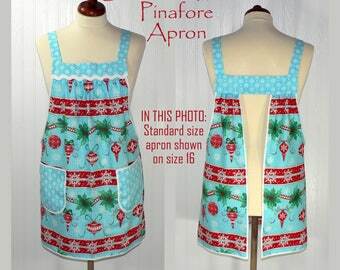 Beautiful quality, comfortable apron!! My new favorite!! A+++ seller! !